Diamond Plate Flooring offers a very high strength-to-weight ratio, plus outstanding corrosion resistance. This product features a slip-resistant, molded-in diamond pattern for improved footing. Diamond Plate Flooring is made using a compression-molding process that combines heat and pressure to produce a high-density high strength panel - weighing 1/3 as much as steel. 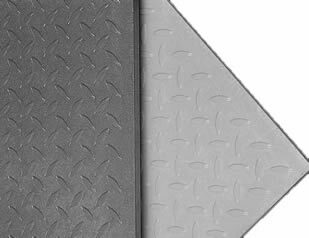 Diamond Plate Flooring is ideal as a trench cover and in applications where a solid plate is necessary to contain vapors.